From 1 February 2019, a new maximum device speed limit of 10km/h for motorised wheelchairs and mobility scooters for use on public paths has been implemented by LTA. This new law helps to protect pathway users, while ensuring that those with genuine mobility challenges can still have proper use of such devices. AGIS Medical Supplies Pte Ltd follows LTA’s legislation closely, and AGIS Medical Supplies Pte Ltd’s wheelchairs and mobility scooters do comply with LTA’s guidelines. 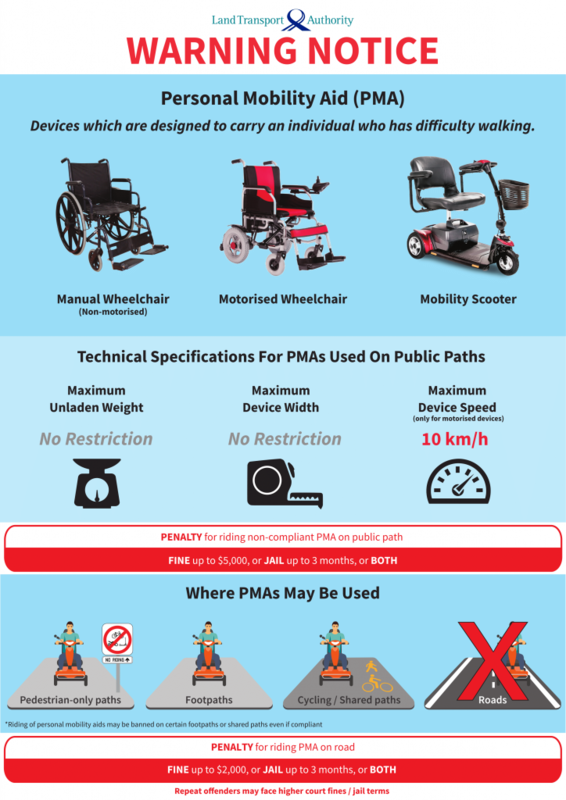 Please do note that the Personal Mobility Aid (PMA) are restricted to be used on the road. Should one be found driving a Personal Mobility Aid (PMA) on the road, one will be liable to a fine of $2000, or a jail term of up to 3 months, or both.